Origanum majorana is native to North Africa and Southeast Asia and it now naturalizes in the Mediterranean region. It is cultivated throughout North America. The Greeks called this plant "joy of the mountain". They believed it was precious to Aphrodite, goddess of love, and they used it to crown newlyweds on their wedding day. 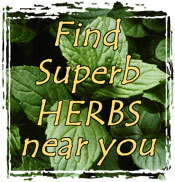 Harvest and Use: Sweet marjoram is mainly a culinary and no cook should be without it. It is often found in bouquet garni, a classic herb combination that includes parsley, thyme, bay, peppercorns, allspice, and tarragon tucked between two stalks of celery tied together, and then tied to the pot handle for easy removal. These are used to flavor soups, stews, and sauces. 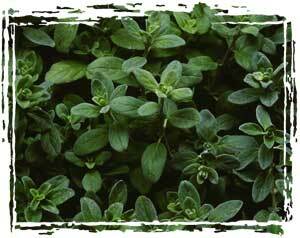 Marjoram has a mild oregano flavor with a hint of balsam. It is wonderfully aromatic. It is good with veal, beef, lamb, roast poultry, fish, pates, green veggies, carrots, cauliflower, eggplant, eggs, mushrooms, parsnips, potatoes, squash, and tomatoes. It compliments bay, garlic, onion, thyme, and basil. It can be used as a substitute for oregano in tomato sauces for pizza, lasagna, and eggplant Parmesan. Add it to marinade for artichoke hearts, asparagus, and mushrooms. Use it in herb vinegars, oils, and butters. Marjoram is a good herb to add to other stimulating herbs for the bath. It has mildly antiseptic properties and is good for the skin. Marjoram sprigs add color, aroma, and scent to a culinary herb wreath. It is nice in potpourri and pillows. Taken medicinally, marjoram tea is helpful for tension headaches and minor digestive upsets. A strong infusion or essential oil added to bathwater, an ointment, or a compress of marjoram has been used for rheumatic pain. Use leaves throughout the growing season, but the main harvest should be just before it flowers when the color and flavor is at its best. Cultivation and Propagation: Sweet marjoram is a shrubby tender perennial that grows to about 1' tall with wiry, red-brown stems and downy gray-green aromatic leaves. It produces tiny white flowers on clustered spikes in summer. It is a zone 9 plant and is therefore grown as an annual in cold climates. It does well in a container and can be brought in for use during the winter. It hates winter wet and poor air circulation and likes a temperature of 70°F during the day and 60°F at nighttime. It likes a rather alkaline pH of 6.9, well drained to dry soil, and full sun. It grows quickly and should be pinched back often to remain bushy. When growing from seed, sow it thinly and do not cover the seed, as it needs light to germinate. Pests: Damping off can be a problem in the seedling stage.